I’ve been trying my hand at some Mars Rover color imagery, pasting pancam images into Photoshop channels and tweaking colors (with cues from some cool BABB advice and Keith Laney’s pancam calibration page) to approximate how the human eye might see the surface of Mars. The first time I tried combining channels from Spirit’s photos of the Columbia Hills, I was startled at how blue the sky turned out. 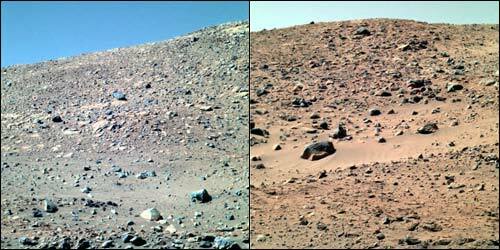 I still can’t hold a candle to Keith Laney’s work on the Spirit and Opportunity pancam images. … shining in the East.